These shoulder exercises are a great starting point if you have been inactive or if you have a history of shoulder problems. Practice these exercises 1-2 times per day to begin rebuilding the basic strength in your shoulder. 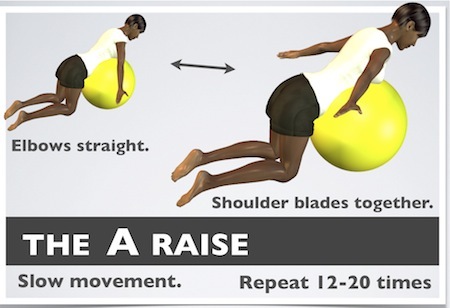 This routine would also be effective as a warm up prior to more vigorous shoulder exercises. *Please check with your health care provider before beginning any exercise program. 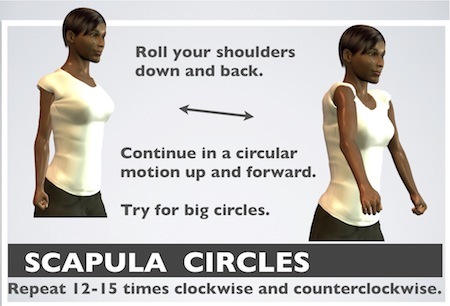 With your arms resting at your side, slowly roll your shoulders forward, down, back and up as shown. Move slowly through your full range of motion to get a gentle stretch through the chest and scapular muscles. 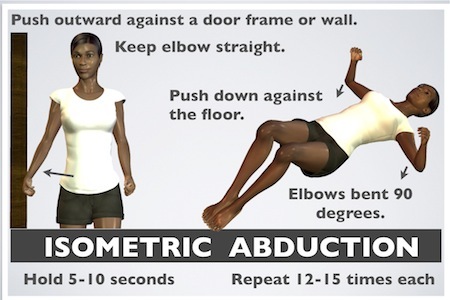 Repeat 12-15 times and then reverse directions. This move helps boost your circulation and prepares your muscles for this routine of shoulder exercises. 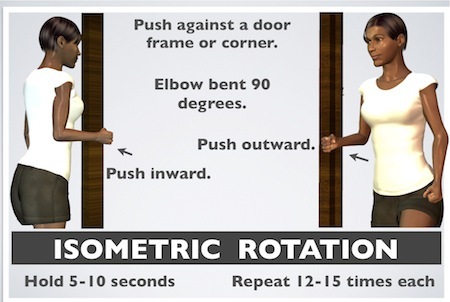 Stand just inside a door frame or facing the corner of a wall with your arm at your side and your elbow bent 90 degrees. Push inward against the wall. Hold for 5-10 seconds and repeat up to 15 times. Start with a moderate effort and increase your effort gradually. You should feel your chest and front deltoid (shoulder) muscles during this exercise. Next, turn so that your side is facing the wall or door frame. Maintain the same arm and elbow position. Now push outward against the wall. Same level of effort and repetitions as the previous exercise. If you appreciate these shoulder exercises there are many more routines available on this site. See our catalog of free exercise routines. 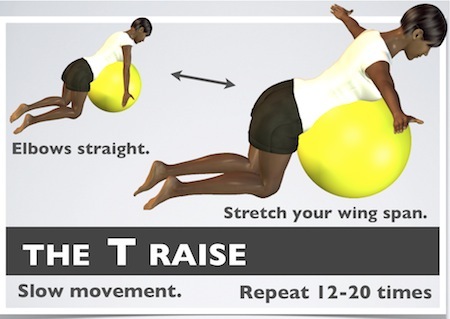 Kneel in front of a stability ball and then lean your weight over the ball. Rest your arms off to the side as shown. Slowly raise your arms at an angle that is about 30-45 degrees away from your side. Keep your elbows straight. Pull your shoulder blades together at the end of the movement and keep your ears away from your shoulders. Slowly return to the start position. Repeat up to 25 times. Use light weights, starting with 1-2# (can of beans) to make the exercise more difficult. Note: These shoulder exercises are arranged from easiest to more challenging. If you have difficulty with an exercise, skip it and work on the other exercises for now. Try again once you are more comfortable with the other movements. Stand next to a wall so that your side is facing the wall. Push outward against the wall with your elbow straight and your arm a few inches away from your side as shown. Hold for 5-10 seconds and repeat up to 15 times. Start with a moderate effort and increase your effort gradually. You should feel your outer deltoid (shoulder) muscles during this exercise. Next, lie on your back with your arms out to the side and your elbows bent 90 degrees as shown. Now push down into the floor. Same level of effort and repetitions as the previous exercise. To make the exercise easier, you can slide your arms closer to your sides. Next, grab the end of the band or tubing and turn so that your side is facing the door frame. Bend your elbow 90 degrees. Step far enough away from the door so that you feel some resistance in the band. Turn your arm outward from your body as shown for the starting position. 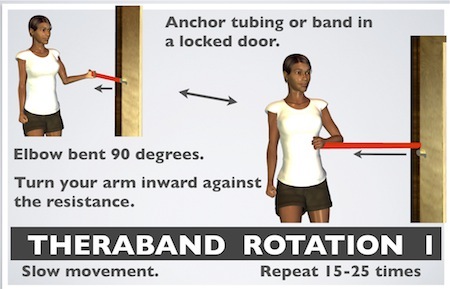 Then turn your arm inward against the resistance of the band or tubing as shown. Adjust the level of resistance to moderate by stepping closer to or further from the door during the exercise. Repeat up to 25 times. Kneel in front of a stability ball and then lean your weight over the ball. Rest your arms off to the side as shown. Slowly raise your arms so that they are straight out your side. Keep your elbows straight. Reach your arms outward for the widest possible wing span and keep your shoulders away from your ears. Slowly return to the start position. Repeat up to 25 times. Use light weights, starting with 1-2# (can of beans) to make the exercise more difficult. After you finish your routine of shoulder exercises, try my stretching exercises for the shoulders and arms. Return from shoulder exercises to physical therapy exercises.